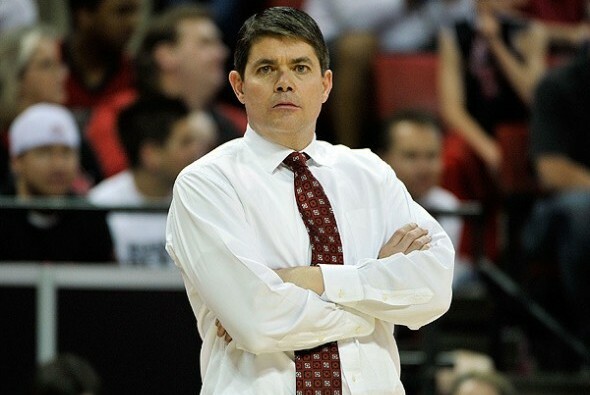 New Washington head basketball coach Mike Hopkins filled out his staff Tuesday by hiring Dave Rice, a one-time head coach at UNLV and a long-time assistant. New University of Washington head basketball coach Mike Hopkins Tuesday named Dave Rice as the third and final assistant on his staff. Rice, a former head coach at UNLV and most recently an assistant at the University of Nevada, will join Will Conroy and Cameron Dollar as Hopkins’ top aides. “Dave is a proven winner,” said Hopkins. “He has extensive coaching experience, not only as an assistant but as a head coach as well, and will be a huge asset to our program. Everywhere he has been has seen unprecedented success and he has also had a huge impact on the student-athletes he has worked with both on and off the court. Rice coached at Nevada last season and helped guide the Wolf Pack to 28 wins, second-most in program history. Nevada won the Mountain West regular-season and tournament titles en route to earning the team’s first trip to the NCAA Tournament since 2006-07. During his career, Rice has been a part of 11 staffs that advanced to the NCAA Tournament. Prior to joining Nevada, Rice spent four seasons as head coach at UNLV, where he led the Runnin’ Rebels to NCAA Tournament appearances in 2012 and 2013, He is the third-winningest coach in UNLV history behind Jerry Tarkanian and Lon Kruger. UNLV won 20 or more games in three of his five seasons. During that time, Rice’s teams had 10 wins over Top-25 opponents, including an upset of No. 1 North Carolina. Rice spent 18 years as an NCAA Division I assistant coach prior to earning the top job at UNLV, including stops at BYU (2005-11) and Utah State (2004-05). Rice played two seasons at UNLV (1989-91) as a reserve guard for Hall of Fame coach Tarkanian and two seasons at Mt. San Antonio College (1987-89). He earned a bachelor’s degree in political science at UNLV in 1991 and a master’s in business administration in 1993. What happened to Coach Brad Jackson?